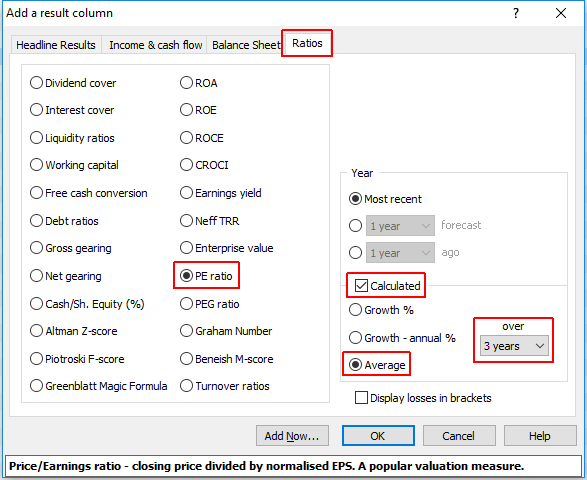 In this tutorial, we look at how to populate a List table with the information most relevant to your investing strategy. For more about customising the appearance of List tables, please click here. In this example, you can use one of the blank List Tables and rename it to "Share Performance". If you are using more than one List Table, it is a good idea to give each a specific and unique name. Note that in ShareScope Gold, the name of the selected table appears at the very top of the screen. The default blank tables have two columns: No. and Name. From here you are able to start populating the table with new column data. 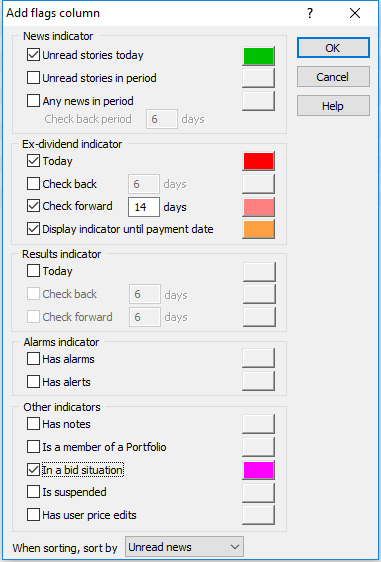 The Flags column highlights a recent or upcoming event - such as an ex-dividend date, a new news story or corporate action. To display Flags to the left of the Name column, right-click on the Name column heading, select Add General column and then Flags... from the sub-menu. This shows if a share is currently the subject of a bid situation. For example, at the time of writing, Sainsbury is attempting to buy Home Retail Group, and so is flagged as a B in the example below. Hovering the mouse over an X flag shows the ex-div date, dividend amount and date of payment. You can also hover over other flags to view more detailed information. If you double-click on the News flag, it will display the most recent new story for that share. You can use the << Previous and Next >> buttons to navigate to other stories in the specified time frame. The News flag will disappear once all stories have been read. 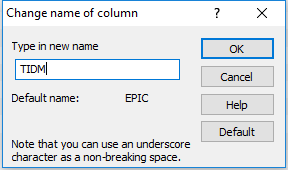 To add an EPIC column in-between the Flags and Name column, right-click on the Name column heading, select Add General column and choose EPIC from the sub-menu (note that new columns are always added to the left of the selected column). EPICs are named after the London Stock Exchange's Exchange Price Information Computer. They were renamed to TIDM (Tradable Instrument Display Mnemonics) in the 1990s. However, EPIC has remained the more popular of the two acronyms. In the United States, they are generally known as a company Ticker. 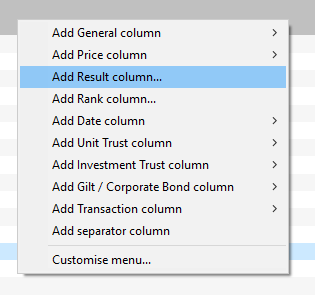 To change the name of a column, right- click on the column heading and select Change heading... from the menu. This will open a dialog box allowing you to rename the column. You can also see the Default name and a Default button to revert to the original heading, if required. To add the latest close price, right-click on the grey bar to the right of the Name column heading. Select Add Price column and then Last price from the top of the sub-menu. The Close column is, by default, set to dynamically decide whether to show the price in pounds or pence (if GBP) based on the value of the share. You can change the Dynamic Pounds/Pence option to Pence and deselect the Show currency symbol option. 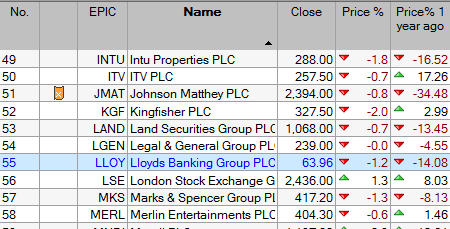 Let's now add a couple of price percentage columns to see how the shares have performed over different timeframes. In this example, we'll look at both the daily change and change over the previous 12 months. For the daily change, right click on the grey bar to the right of the Close column and select Add Price Column followed by % Price + / -. 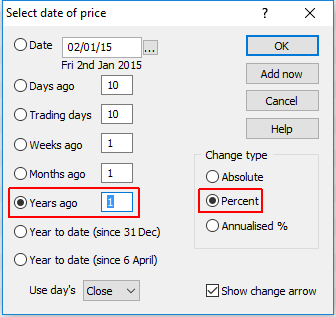 Here, you can select whether you want to display the price change from a specific date or for a given period of time. You can also choose to return the result as an Absolute change, a Percent change or an Annualised % change. Select 1 year ago and Percent. Press OK to confirm or Add Now... to add further columns. To display the percentage change for the year to date, choose either Year to date (since 31 Dec) for the financial year or Year to date (since 6 April) for the tax year. The PE ratio is one method of measuring the value of share (for more about using PE, click here). Let's start by adding the Forecast PE, which gives an indication of the value of share based on the expected earnings of the company. Net Asset Value (also known as NAV or Book Value) is another company valuation metric. 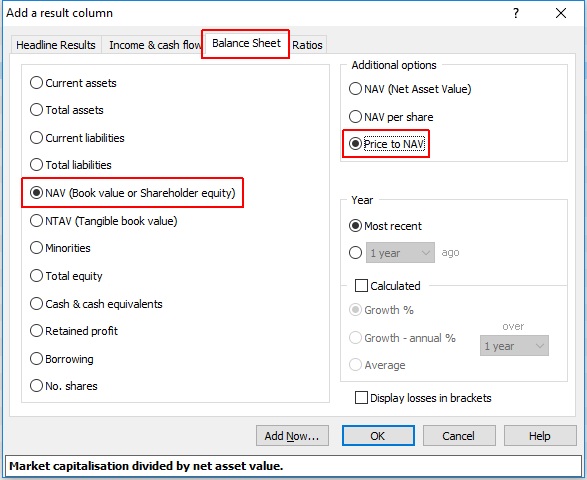 The accompany Price to NAV looks at the share price relative to its value, and generally-speaking, a value of less than 1 indicates that a company is trading at a discount to its net asset value (click here for more information). To do so, tick the Calculated option and select Average over 3 years. We'll begin by adding Yield - Historical. This takes the dividend figure for the last financial year and divides it by the current price, giving a percentage figure. The table now appears as follows. Note how the latter column allows you to see, at-a-glance, shares with positive or negative yield growth. Dividend cover is a measure of company's ability to pay its dividends. In simple terms, a ratio of under 1 indicates that a company is paying more in dividends than it can actually afford (for more information, click here). 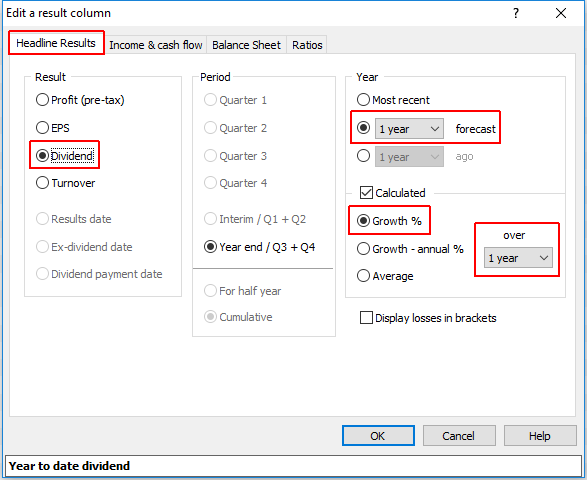 An alternative to Dividend cover is Free Cash Flow (FCF) dividend cover (click here for a detailed explanation). 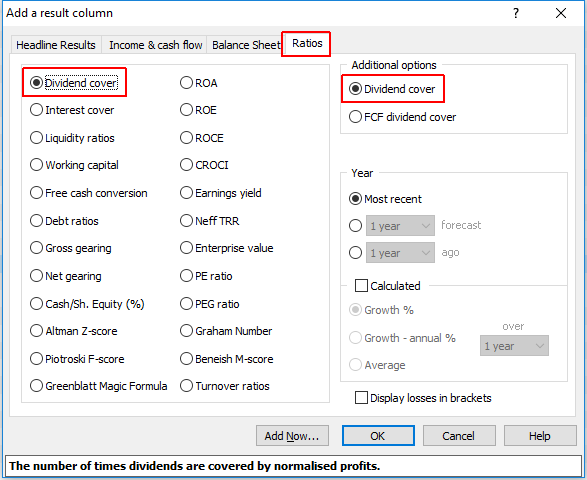 To display this measure, simply select FCF dividend cover under Additional options, as shown above. 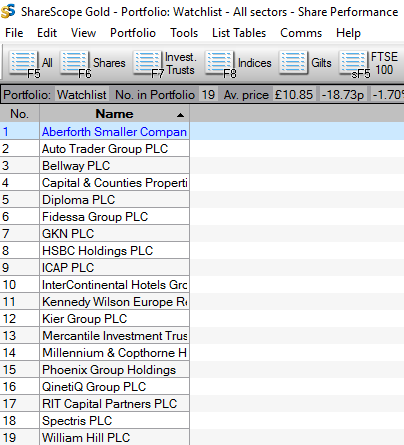 ShareScope contains a series of columns dedicated to showing Investment Trust data. 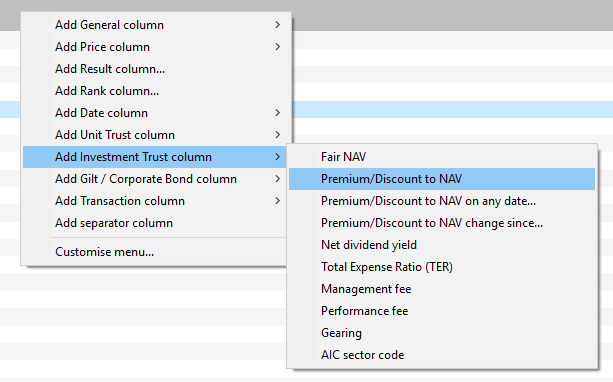 You can find these under the Add Investment Trust column option in the Add Column menu. 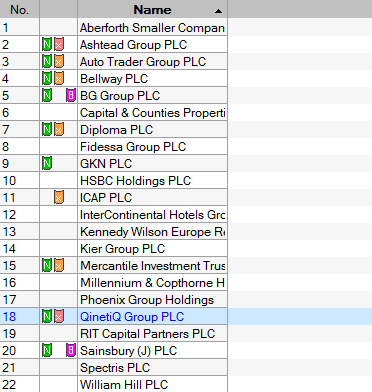 Note: ShareScope carries distinct columns for Equities, Investment Trusts, Unit Trusts and Gilts & Corporate Bonds. Some of these columns are only relevant to a particular type of instrument. 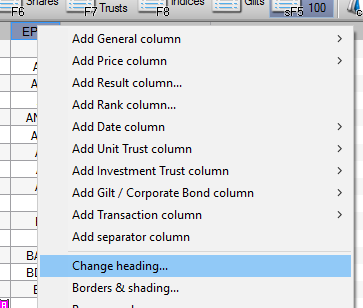 You can also Add a Separator column... between equity-focused columns and investment trust columns to help differentiate the two. This table, now complete, can be used to look at a predefined list of instruments (e.g. 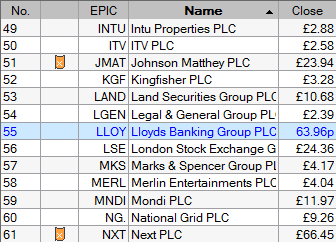 FTSE 350), a watchlist or portfolio of shares in which you have a holding.